The unique feature to the bolt together or modular safe room is its handicap accessibility and the versatility to be custom built to almost any size allowing it to be set onto any pre-existing concrete pad. The master closet or spare bedroom is the most popular place to install. 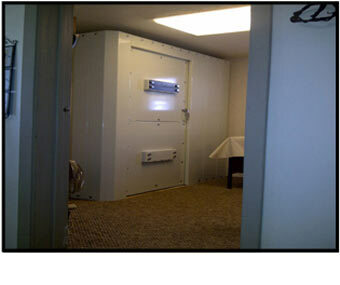 Safe rooms have been successfully impact tested at Texas Tech University. Safe rooms were evaluated to structurally bear the wind load of a 250 + mph tornado. Shelters can be placed inside your garage/carport or outdoors with a concrete pad to attach to. Door weighs approximately 250 lbs. Doors can be ordered to swing out for maximum room and handicap accessibility. Air vent deflector covers keep out flying debris and are easily removed to allow quick access to the inside door latches. The (4) 1" anodized steel door pins/locks hold the door securely shut. Each of the (4) hinges has a removable pin for easy door removal. 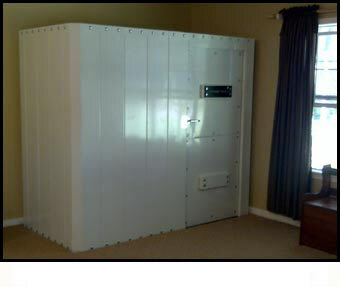 Safe rooms are made of a combination of 3/16 and 1/4 inch steel. 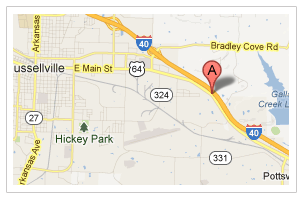 All safe rooms are built to meet and exceed all standards set by FEMA, the NSSA and the ICC 500 building codes. Custom sizes are available. Measure the space you have and let us know what you need. Standard height is 6'4" tall but can be ordered up to 8 foot tall on custom orders.